Batwing and Dawn battle Father Lost in the streets of Tinasha! 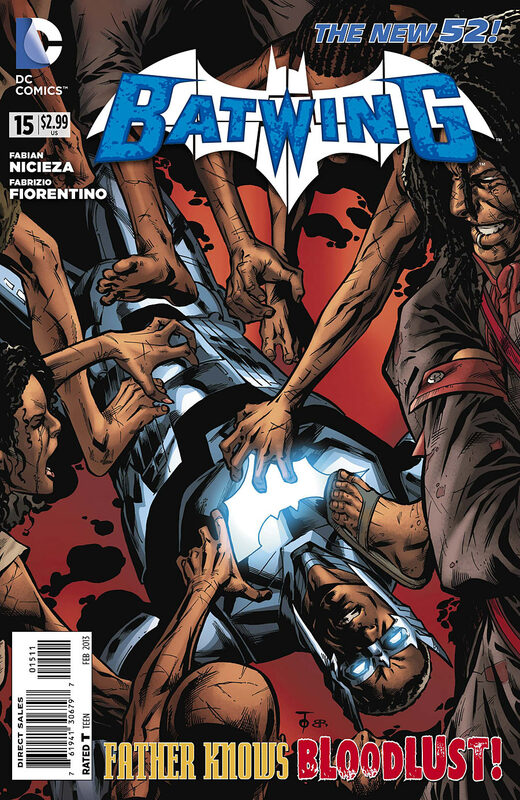 Father Lost’s new powers are proving too much for Batwing and his new ally…time for a last ditch effort that might just get them both killed! Dawn lies on the floor dying as blood pours out of the wound created by Father Lost’s dagger. The villain takes control of Batwing who almost kills a police officer. Matu manages to take control of the armor and bring him to his senses. He rescues Dawn and takes her to the hospital where miraculously she recovers. Art– While Fabrizio Fiorentino’s illustrations fall a bit short of expectations. Pete Pantazis colors add vibrancy and life. In the better sections the colors actually look textured. This is great work! Cover- Father Lost and his horde towering over Batwing ready to tear him to pieces, very literal. Origin of a villain- We finally get the origin of the villain in this issue. His similar history to David is interesting. One is left with the impression this could have David if he had met this mysterious woman instead of Matu Ba. Teamwork-This issue we also get some spotlight on the teamwork of Batwing and Matu, so similar to Bruce Wayne and Alfred it’s funny. When Batwing is mind controlled we realize that there are safety parameters which allows remote control of the armor by Matu. While this was an ingenious revelation that ended up saving the day it may well become an Achilles Heel for Batwing if a villain ever takes control of the armor while he’s out in the field. Action- Lots of fisticuffs in this issue, Batwing‘s gadgets are also impressive giving him a definitive edge over Father lost and his crazed horde. 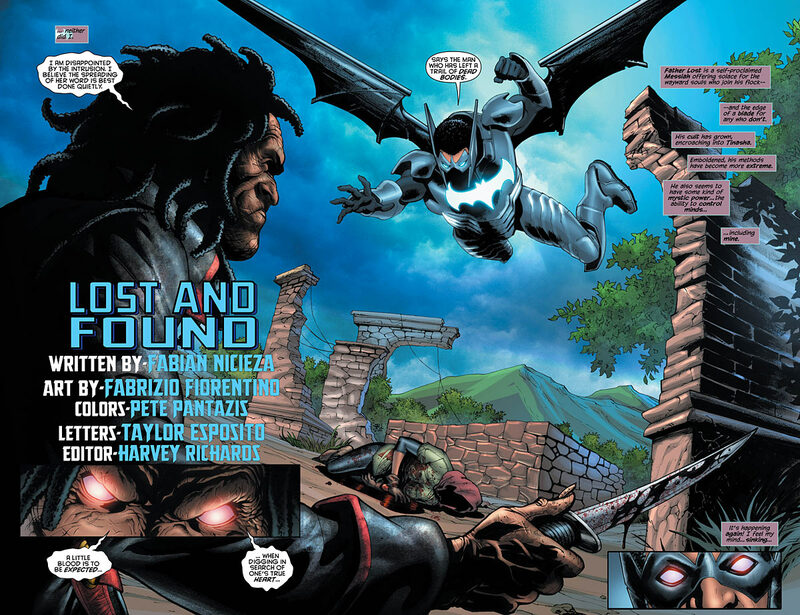 Black Heroes– Dawn, Father lost, Batwing and Matu Ba. More black than you typically get for a month in a typical mainstream comic. Uneven- The illustrations from Fabrizio Fiorentino were uneven though clearly stylized. He needs to work on his consistency from start to finish to be worth the cover price.